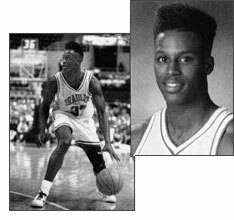 One of many Manual standouts to play for Bradley, Curtis played two seasons for the Braves after transferring from Drake. In those two years, Curtis produced 1,248 points to rank 19th on the all-time scoring list. His 24.5 ppg average was the highest per game average in university history at the time. A two time All-Missouri Valley Conference selection, Stuckey also led the Braves in free throw shooting both seasons. In 1991 he won the Karl Watson Memorial Award for the highest point average among senior players. At Manual, Stuckey was a key performer on the 1985-1986 team that finished 3rd at State with a 31-2 mark. The following season he teamed with David Booth to lead the Rams to a 31-0 mark before falling to Quincy in the State quarterfinals.